Brian Easthope of Stoney Trail Mazda is this year’s winner of the Canadian MazTech Service Skills Competition in Toronto. 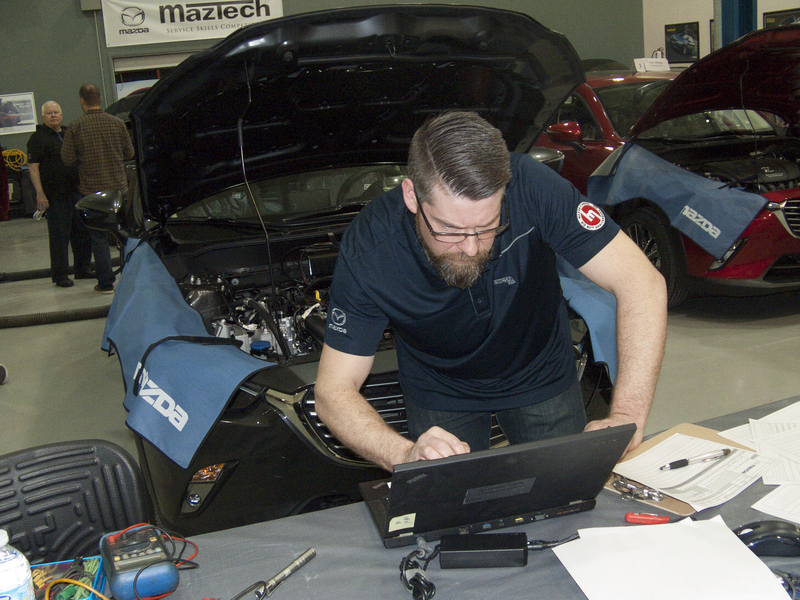 Brian Easthope, of Stoney Trail Mazda in Calgary, is the winner of this year’s MazTech Service Skills Competition, held in Richmond Hill last month. Mazda’s top technician says win, lose or draw, the thrill of competition sure beats the routine of daily work in the bay. Brian Easthope won the top spot at the company’s annual MazTech Service Skills Competition in Canada, outscoring nine other technicians from across the country. 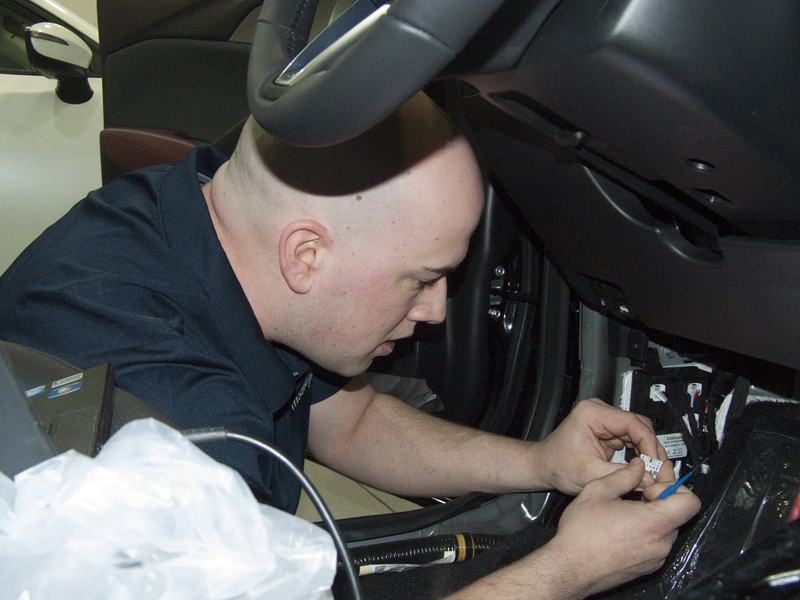 Despite the stress of racing the clock to repair a bugged vehicle under the scrutiny of friends, family, and coworkers, Easthope says the competition offers its own reward: the chance to realize your potential as a technician. He was joined on the podium by Dany St-Pierre of Quebec’s Mazda de Sherbrooke (second place) and Adam Bochek of Ontario’s Mazda of Hamilton (third place). Cristopher Puckering of Western Mazda in Corner Brook, Nfld. Rob Murdoch, Mazda Canada’s national manager of technical services, welcomed them all to the company’s Canadian headquarters in Richmond Hill, Ont. Last year’s first-place finisher, Marcin Malocha of Westowne Mazda in Toronto’s west end blew the starter’s horn to get the two-hour competition underway. 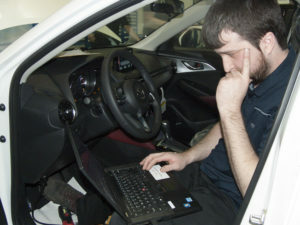 Adam Bochek of Ontario’s Mazda of Hamilton took third place in the annual competition. 7) ADD does not display correctly. Dany St-Pierre of Quebec’s Mazda de Sherbrooke came in second place. In addition to those complaints, there were also three unrecorded complaints: a missing taillight, loose emergency brake lever, and a non-functioning wiper. He entered the trade as an apprentice in 2009 and was licensed in 2013. He says nearly a decade of working at the dealership has made him pretty comfortable on Mazdas. And, like many technicians, he enjoys the challenge of trouble-shooting. It is in keeping with his personal philosophy of continuous learning. This year’s competitors all went home with a Google Home device, and an oscilloscope module for their computers. The top three finishers also earned a cash prize. And Easthope gets the opportunity to represent Canada at Mazda’s International MazTech competition in Japan next spring. He’ll work as a team with last year’s winner, Marcin Malocha, at the world event held every two years at Mazda’s international headquarters. The 2017 Canadian team consisted of Yannick Nadon of Elite Mazda in Gatineau, Que., and Reynold Bergen of Gerry Gordon’s Mazda in Winnipeg, Man. They’ll proudly tell you that they ended up in fourth spot – although they’ll have to add that only the top three finishers are announced, and every other team is tied for fourth. “This is a really great event for Mazda,” says Craig McQueen, a service training instructor for Mazda Canada and one of the organizers of the Canadian national event. He says competition not only offers the company a great way to recognize technician talent and celebrate their skills, but it also cements their loyalty to Mazda and gives them something to strive toward. Certainly that was the case with Easthope, who competed for the first time last year. Many of the repeat competitors say they have come to appreciate being part of a network of top diagnosticians. They turn to each other when faced with a difficult problem in the bay. According to the official MazTech rules, Easthope won’t be elible to compete next year, but if he’s invited to watch or help adjudicate, he says he’d love to go. “I wouldn’t miss it!” he says. Check out our gallery of photographs below.